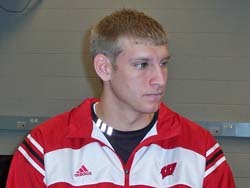 Wisconsin Badger senior Brian Butch (pictured) is one of 30 players invited to participate in the USA Basketball Men&apos;s Pan American Games Team Trials that will be held at Haverford College (PA) on July 12-14. The Trials will be used to select the finalists for the USA Basketball Pan American Games squad that will look to capture gold at the 2007 Pan American Games that are being held in Rio de Janeiro, Brazil, July 13-29. This is the second time Butch has been involved with USA Basketball, having participated in the 2002 Youth Development Festival. Butch is one of three Big Ten players to be invited to the Trials. Joining him will be Michigan State&apos;s Drew Nietzel and Indiana&apos;s D.J. White. Butch is also one of two UW athletes competing for Team USA this summer, joining Jolene Anderson of the women&apos;s basketball team, who is a finalist for the 2007 FIBA Under-21 World Championship team. Trials for the USA Pan American Games Team will be held July 12-14 at Haverford College with the 30 U.S. hopefuls participating. The official 12-member USA Pan American Games squad will compete July 25-29 in the 2007 Pan American Games men&apos;s basketball competition.